Quite unique colours some what like Degas in his later years. 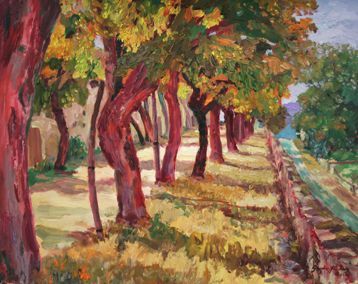 A visionary study, with many surprising and difficult to match colours and textures in the paint, of the Promenade at Castelnau de Montmiral. “I had a strong impulse to paint what I felt not what I saw.” The trees felt much older and more twisted than they realy were so that is how they were painted. They had a feel that reminded me of “The Hobbit” and “Lord of the Rings”, old with a story to tell but not hostile.